In small bowl, combine mayonnaise, chili sauce and horseradish; mix well. Spread each slice of bread with butter. Place bread, buttered side down on cutting board. Place a slice of cheese on all slices of bread (unbuttered side). 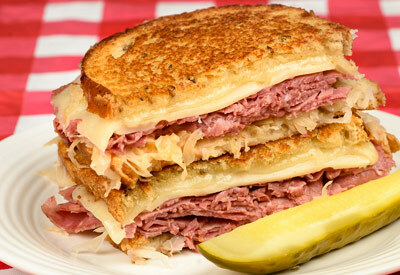 Divide corned beef and place on top of cheese on four slices. Top with mayonnaise mixture and sauerkraut. Cook on a preheated large griddle (or cook two sandwiches at a time in a large skillet) over medium-low heat 4 to 5 minutes per side or until bread is toasted and cheese is melted.